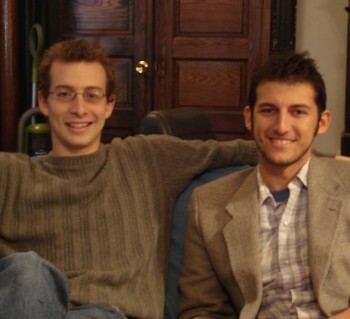 Scott Sheppard '06 (left) and Asher Spiller '06 have co-founded a new literary magazine called The Spur. They joined us online to tell us about their idea, and why a pair of Generation Web-ers would cast their lot in print. HC: Tell us about The Spur -- what are your editorial goals and point of view? Sheppard & Spiller: We first conceived of the project while still at Haverford, but at that time there was only a vague desire to collaborate on something creative and literary. The impetus to see the project through came in large part from our experiences during our first year after college. For many people that first year out in the real world brings with it a great deal of anxiety. There is a constant sense of urgency, a need to succeed, or simply to keep oneself financially afloat. These pressures aren't limited to ones first year out from college. They're common to all those living in and engaging with the marketplace. Under these circumstances it's extremely difficult to give both your creative expectations of yourself and your ethical expectations of yourself their proper due. We see The Spur as providing a space to pause and reflect on the issues and dilemmas we all face in our local and global community and to express the products of that reflection creatively, both as readers and writers. Two of the most important rules we've imposed upon ourselves in compiling material for The Spur and writing for it ourselves are never to pose an agenda and never to pass judgment. We want our magazine to raise questions, not provide answers. We also find it especially important that the work we include is timely, meaning that it has some bearing on a contemporary question or issue. An interesting concept we often discuss when reading fiction submissions is the way fiction can report the news, can reveal certain realities in ways that a news article cannot. Sheppard & Spiller: Above the masthead for this first issue weve written: We do not have an agenda, and we do not have a message but merely a sneaking suspicion that now, as always, is the perfect time to write, read and above all, think. This magazine constitutes a response to a kind of obligation to participate in artistic dialogue. In our first issue we had submissions coming in from New York, California, Philadelphia, Buenos Aires and elsewhere. I think many people, beyond their own love of writing, find this kind of artistic exchange to be extremely important. HC: Why a print product? Seems so...old media! Is there an online version? Sheppard & Spiller: An excellent and incredibly relevant question. We do have a website and you can read some content there (www.spurjournal.com). But yes, the selections we have online are mostly meant to entice people to get the print version. I'm sure there is an element of nostalgia in our decision to print the magazine. Though on another level, I think there are certain kinds of writing that still lend themselves more to the printed page than the computer screen. Different mediums demand different stylistic choices. You are less likely to print out a blog and read it on the subway on your way to work than you are to grab a book. Perhaps someday novels will be rolling by like stock-tickers on your iPod screen for you to read while youre watching a television show or surfing the internet. Who knows? Right now I still like to read fiction on sheets of paper. HC: What other literary publications do you admire? Sheppard & Spiller: As far as fiction goes American Short Fiction is excellent. One facet of their publication that we admire is the way themes for their issues emerge organically, do not feel forced and serve as a thread between stories rather than a lens forced upon the reader. The Believer is another excellent magazine that consistently achieves a great degree of relevance. The Spur was also inspired in part the magazine H2SO4, which used to be published by Jill Stauffer, a former professor at Haverford. H2SO4 was mostly compiled of political and philosophical essays as well as reviews. HC: Is this going to be profitable? Do you care? Sheppard & Spiller: No, The Spur's second issue release party will not be held on a yacht. For now, our hope is merely for the project to sustain itself. It is a labor of love and wed love to keep it going ad-free. We are currently looking for outside sources of funding to assist our production of our second issue scheduled for print in the spring of 2008. HC: What else can you tell us about the experience? Sheppard & Spiller: This project has been a real learning experience for the both of us and has brought with it a great deal of both fun and stress. We're excited to keep the ball rolling. We've added some people to our crew to help us with editing and decision making for the second issue and we look forward to adding some new perspectives into the mix. Much of the energies and ideas that have gone into The Spur's creation were conceived and nurtured at Haverford College. We are greatly indebted.